He’s signed for many, according to http://www.sportscollectors.net/. However, in recent years, he’s been a man on the move. Some collectors have collected nothing but RTS returns, unable to find a current address. I think I’ve located him. If St. Louis can have a storybook season, why not me? One more try! I wondered if other former Cardinals will be by their TVs, too, hoping that their former employer gleans October glory once again. I wanted to devote my current crop of envelopes to St. Lou alums. Coming Thursday: Surprising words from Giants and Athletics broadcaster Lon Simmons. Love the background on the Tyson card — old Busch Stadium in the days of astroturf! 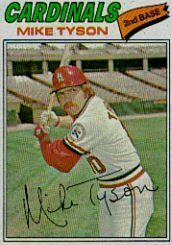 I love the background on the Tyson card — old Busch Stadium in the days of astroturf! Sorry. I didn’t intend to leave TWO comments, and now I’ve left another!